A great fun filled wet and wild activity.Dependent on river levels, you can traverse along rock walls, slide down waterfalls and rapids, squeeze through holes in the rock and jump into pools. 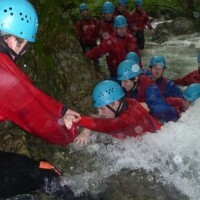 Gorge scrambling or walking is a great fun filled wet and wild activity. After being acquainted with your kit including wet suit, buoyancy aid and helmet, it's off to the river bank. Gorge Scrambling is similar to Coasteering, but rather than traversing the coast, you ascend a small but fast flowing river. Dependent on river levels, you can traverse along rock walls, slide down waterfalls and rapids, squeeze through holes in the rock and jump into pools. Great fun for all kinds of groups and always run according to your groups ability.